If you’ve ever bought a used item at amazon.com, you may not know what goes into the whole process. It’s really not that complicated. Anyone – and I mean anyone – can register on their website to sell items. But what happens next? On the buyer side, you buy the item, and it shows up. On the seller side, the seller receives an email notification with purchase and shipping details. And additionally, an entire team of Amazon workers is there behind the scenes, in theory, to make the whole process work right. In theory, it’s not complicated stuff. But oh yeah, who are those people again, who in theory make the whole machine work? The seller services team? Well, I’m going to pull the curtain back just slightly, and show you a place that can only be described as an appallingly bad, alternate Amazon universe. Believe it or not, that division constitutes the near-antithesis of what is commonly believed to be Amazon’s internal zeitgeist. You know… the values, the ideals, the vision, the philosophy… only the opposite! That might sound kind of crazy to hear or even believe… until you fully understand how bad that team is. Sunil from Amazon seller services once sent me some wise correspondence with the following entreaty: “Do not pressurize buyers to remove feedback.”§ I’d have to agree. Since only the most grizzled, tough-as-nails customers could withstand even a few minutes in my dungeon’s pressure chamber, it’s simply not cool to take it to that level. (But, he didn’t mention water boarding…) But what’s funny though is that statement was in a block of text that was clearly copy-and-pasted into his message. (“Copy-and-paste” is usually these employees’ second language.) In other words, it was a stern admonition given to every seller he spoke to! But it’s when the errors become intentional, that this team of Amazon employees truly earns its “D” grade! On occasion, some of these Amazon employees will actually misstate something on purpose, using their English language impediment as a cover for their mistake! Pretty crazy, huh? Here an unnamed (literally unnamed) Amazon employee submitted a report on my behalf relating to customer fraud. This particular employee also shared a customer’s private contact information with me, for no reason! It was a truly bizarre violation of protocol. At the very top, you have the most important information: What kind of interest rate can I get if I take out a $1,000 personal loan from Amazon. It’s good that’s at the very top. Where else would someone go for a loan, plus what happens if the interest rate changes. Next you have information pertaining to new orders that were placed. I guess that’s semi-important for sellers? And then next, near the middle of the page (roughly where the sports section would be if this were a newspaper), you finally get to highly-critical-but-completely-obscured information like ‘Buyer Messages’ and ‘A-to-z Guarantee claims’. (The A-to-z Guarantee is basically Amazon’s guarantee that a buyer will actually get what’s advertised from a third-party seller. If they don’t, they can file a claim that Amazon will investigate.) These particular fields represent information that materializes infrequently, but is highly, highly critical in nature, and absolutely must be addressed immediately! Yes, I do think we ought to live in an America where individuals can take out small, uncollateralized personal loans from online shopping websites. But, I’m still profoundly confused as to why that “Amazon Lending” widget is on that particular web portal, much less in the single most important spot on that web portal – an Amazon portal that’s succinctly titled “Amazon Seller Central”, meaning a location where sellers are supposed to take care of their seller business. Amazon warns sellers that their respective email clients are a potential hazard, and that buyers’ messages or even A-to-z claims might be incorrectly routed to their junk mail folder. Along with that hazard, we can definitely add intensely awful, intensely ridiculous website design by the website designers at Amazon seller services. Folks, that’s not just broken website design and broken information architecture. That’s not just incompetent and inexcusable. That is negligent. But will Amazon honor its own policies with respect to sellers? No, not necessarily. One Amazon webpage titled “A-to-z Guarantee: Frequently Asked Questions” lays out policies relating to various A-to-z claim issues. And so when I forget to respond to one dubious and fraudulent A-to-z claim, what is their response to me? Their response to me is that my appeal will be summarily rejected, on procedural grounds, since I forgot to respond to the claim initially! (Forgot, because of, you know, those previously-mentioned hazards.) Strange verdict, and even sadder to see Amazon seller services auto-violate itself – even as their own crystal-clear policy on their own website is shown right to them! And even though it only involved a small sum of money, I really don’t have enough negative things to say about that “D” team at Amazon! So no, Amazon will most definitely not honor its own policies on the seller side. Regarding interactions with employees working at Amazon seller services, on the whole, about 50% of those interactions are acceptable. About 15% are above average. And roughly 35% are below average. And needless to say, some of those 35% are shockingly bad. And I haven’t even touched on the dozens of ostensibly-ignored (and even sometimes brazenly misrouted) suggestions that I’ve volunteered to that division, purely out of good will, many of which actually have little to do with sellers, but are instead low-impact changes on the seller side that would greatly benefit customers on the customer side. 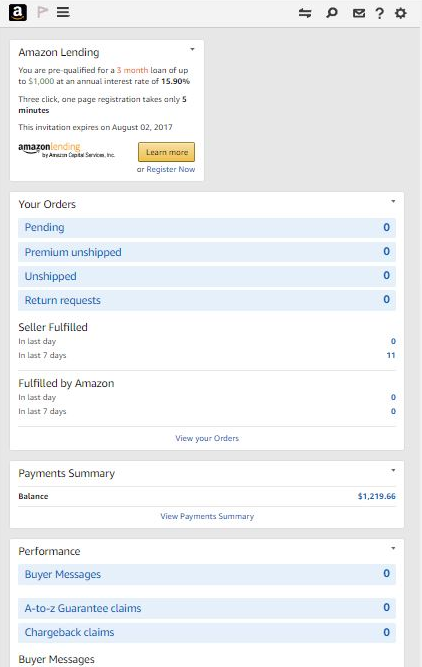 Amazon shows these ads for malware to the sellers. Solution? Obviously you can fire the seller services leadership and fire a bunch of lame employees. (That’s exactly what I would have done in a heartbeat a long time ago.) That type of boldness is the American way. But half of what’s so sinister with something like this… is figuring out whether this shadowy division actually profits Amazon more, or less, when it serves the sellers incorrectly. † The national unemployment rate is 4.3% in mid 2017. That means about 1 in 25 American workers don’t have employment. Considering the fact that these Amazon seller services jobs require almost zero technical skills, and in fact only require basic reasoning, basic comprehension, and English proficiency, the obvious question is why are these simple, English-language-based customer service jobs being outsourced to foreign countries in the first place (or “insourced” for that matter)?… We’ve seen multi-billion dollar corporations like Facebook attempt to evoke notions of corporate responsibility by implementing things like fake-news alerts. While these constructive ideas shouldn’t be discounted, when you get to nine zeros and beyond, real corporate responsibility ought to include more opportunistic hiring of citizens in your own community. ‡ After this blog post was published, I found an easy-to-reproduce bug on the seller portion of the Amazon website. This was right around August 4, 2017. I submitted a bug report to Amazon seller services, at which point a string of 12 employees failed to discern that it was actually a bug report. Ajaz, Kanchan, Amrit, Shubham, Bharat, Abhishek, Manish, Sunil, Radhika, Radhika, Radhika, and Manoj each copy-and-pasted generic answers to irrelevant questions that had nothing to do with software/website bugs. Two other representatives, Keshav and Alok, discerned that it was a bug report. However, Keshav re-requested the relevant data necessary to reproduce the bug, even though it had been provided, succinctly and unambiguously, in the case details. Alok did everything correctly, but was not on the case long enough to drive it to a successful conclusion (which in this case, meant logging a single bug in their bug database!!). Jenny correctly discerned that it was a bug report, but merely did some meta-level administrative work on the case, and did not see it through to a successful conclusion (which again, only required logging a single bug in their bug database!). For this incident/interaction, that’s a competence rate of roughly 7%. Technically, that might have been a new low, but I also can’t say it surprised me. (Also, this division does solicit and process bug reports, so in general this wasn’t something foreign or new.) Most importantly, it tended to corroborate my suspicion that English speaking wasn’t the extent of the problem, but also English reading and comprehension. That’s not really the representatives’ fault, but it is the fault of the hiring managers and executives who thought it would be a good idea to hire them for this job – a job whose principal requirement is English proficiency. || “I would kinldy request you to let s know what exactly is your concern.” Yes, after this blog post was published, that message verbatim was actually sent to me by an Amazon employee (in their seller services division). (The employee ignored the previous message history that he had been assigned to handle, and asked me to restate everything back to him. Which sadly is almost the rule over there, not the exception.) 1.) It’s clearly 150% unprofessional. 2.) Yes it sure does seem like there’s too many typos. 3.) How to attribute those glaring, conspicuous errors… that’s another matter altogether. Those ubiquitous spell checkers and grammar checkers – I guess employees over there turn ’em off. ¶ Later on, I accidentally discovered the most hilarious thing yet – a contingent of sellers who earnestly swear that you actually have to post all seller issues onto the “Amazon Seller Forums”. So that other sellers can somehow solve the problem? No. So that the problem might be solved at all? No. They say you must do this because of rampant, chronic incompetence in the Amazon seller support division, and apparently there is (or was) a single named moderator whose job it is to watch over that massive seller forum (containing zillions of comments about bugs, issues, problems, complaints, and threats against Amazon), and this lone Amazon forum moderator has been known to be competent if she chooses to attend to the issue!! I’m not joking in any way about this, and I’m not even sure how many levels of dysfunctional this is. First, that the “best practice” for addressing any issue on the seller side would be to not contact Amazon seller support! And second, that this hidden work-around involves some kind of unofficial Amazon Lottery. And third, that all of this zany dysfunction almost looks like some kind of concerted move thrown together by the greater Amazon corporation.